Decorate your studio with this 24″ x 36″ wall poster to reinforce technique and artistry at every lesson! Learn about our student-centered curriculum. Join the Teaching Adventures Club. 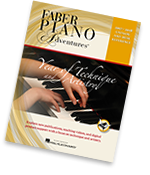 Download the Piano Adventures Player App. Explore new repertoire. Find a teacher in your area. Learn tips for student success. Certified instructors who lead workshops and teacher training around the world.